In Rwanda, the place to go for chimp tracking is Nyungwe Forest National Park, renowned for primates, a visit to this park is another probable way to explore Rwanda. Found in the south west of the country at the Burundi border, Nyungwe Forest covers upto 1015 square kilometers, and inhabited by a reasonable number of species of mammals, birds, butterflies, and plants. Mammals mainly include chimpanzees, monkeys, leopards, golden cats, wild cats, serval cats, stripe jackal, mongoose, Congo, clawless otters, sometimes seen by the local people though chances of visitors seeing these nocturnal mammals are very minimal. In Nyungwe forest you will hear and smell the chimpanzees before you actually sight them, tracking Chimpanzees and actually seeing them as they go about their normal life is way amazing more so that they are closest to Humans, they play, care, anger just as we do. During the tracking, a ranger takes the lead through the thick forest trying to establish the whereabouts of the chimpanzees by using chimp calls, feeding signs and nesting sites as you obediently and expectantly follow. Chimpanzees are best seen in the mornings shortly after they awake from their nests, and before they start to look for food swing from branch to branch. 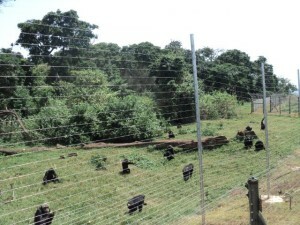 Nyungwe Forest is inhabited by over 400 chimpanzees, out of which two communities are habituated and nurtured to relate well to humans and are currently open to visitors who wish to have an experience of the kind. 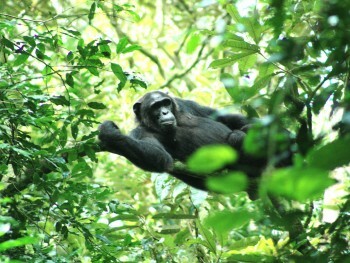 One community of the chimpanzees in Cyamdungo and the second is located at Uwinka (Mayebe). Plans to open up more communities are underway exhibited by a third group which is still in the early stages of habituation; this will increase the activity in the park. Chimpanzees can be well tracked throughout the year but best time is from June-August, during this time, there is usually abundant fruits in the forest, chimpanzees are then easily seen as they enjoy the fig fruits. 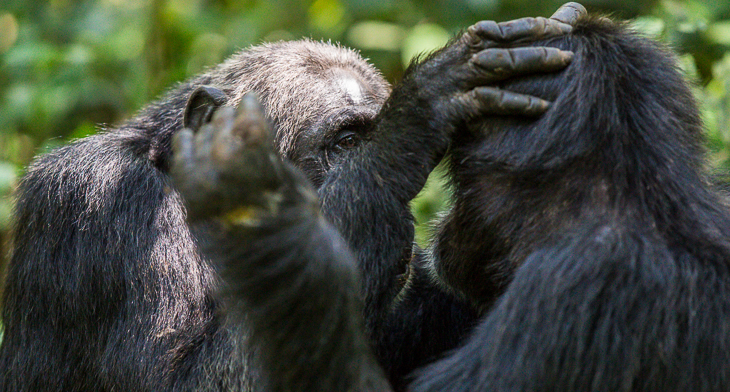 Remember chimpanzees are in their natural so viewing them is not guaranteed for one reason or the other. When you see them well and good but if by any chance you don’t!, do not be disappointed or even blame your guide or the host company, you just have to take it easy and enjoy the beautity of going in the footsteps of the chimps. What are the Park fees for Chimp tracking? Gisakura Guest House has clean establishment but with shared bathrooms. There are number of camping facilities at: Uwinka Visitor Center which has two campsites with toilet and shower facilities, Wilderness Campsites. 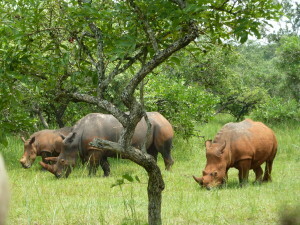 Other Campsites are at the summit of Mt Bigugu, Ngabwe, and at Congo Nile Divide Trail. This entry was posted in Africa Safaris Blog and tagged chimpanzee tracking, Nyungwe forest, Rwanda, Safaris by Gorillas & East Africa Safaris. Bookmark the permalink.